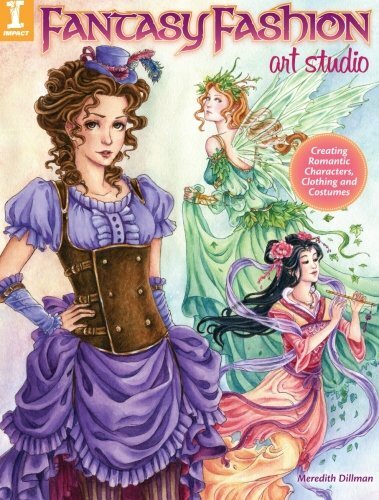 Fantasy Fashion Art Studio is a nice beginners book to get into drawing fantasy characters. All the characters featured in the book are female though, but they come from different genre so you still have a nice variety of style and designs to look at. The instructions are elementary but enough to get you started. They come in the form of short tips for certain effects or techniques, mini and full step-by-step demonstrations. There are instructions on figure drawing, designing your characters and costumes, drawing backgrounds and props. They are nothing too technical and are easy to follow along with the accompanying pictures. The primary medium used is watercolour. The examples and art featured look quite beautiful. You can also check out more artworks from the author Meredith Dillman's website. This is a good and fun beginner's book to get started with drawing and exploring fantasy characters.